Fortino Morales III is the manager of R'Garden, the UC Riverside community garden. He spent two years at UC Santa Cruz as an intern with the Center for Agroecology and Sustainabe Food Systems. Fortino Morales III, 28, worked with CASFS after graduating from UC Riverside in 2011. 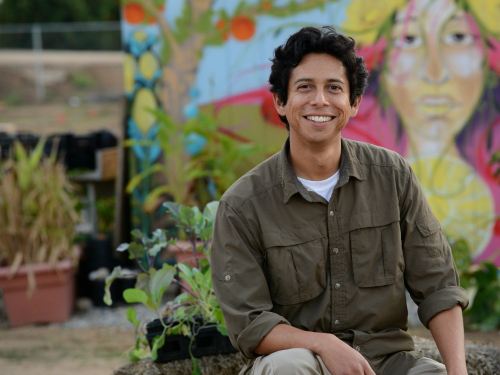 As an undergraduate, he founded UCR's community garden, established the garden’s first student-run course, the Urban Garden Seminar, and ushered through a student referendum to fund sustainability engagement. He later returned to UC Riverside as the first manager overseeing the 3-acre sustainable community garden called R’ Garden. The 30 Under 30 awards recognize 30 young pioneers and innovators inside and outside the UC system who have made outstanding contributions to a wide array of food-related fields, including food production, food access and security, food sourcing, food education and communication, and food policy and public impact. UC President Janet Napolitano started the awards to highlight and amplify the work being done by 30 young leaders and further encourage dialogue about food education, access and security, health and sustainability, in line with the initiative’s goals. The honorees were selected through a comprehensive nomination and review process, with a selection committee of industry leaders and influential voices in the food movement, both from within the UC system and the broader public. Napolitano launched the Global Food Initiative in 2014 to develop, demonstrate and export solutions that help put the world on a path to sustainably and nutritiously feeding itself. “Food is at the heart of issues related to sustainability, climate security and healthy communities,” Napolitano said. The initiative involves all 10 UC campuses, UC’s Division of Agriculture and Natural Resources and the Lawrence Berkeley National Laboratory. It is guided by a systemwide working group appointed by Napolitano and the UC chancellors.